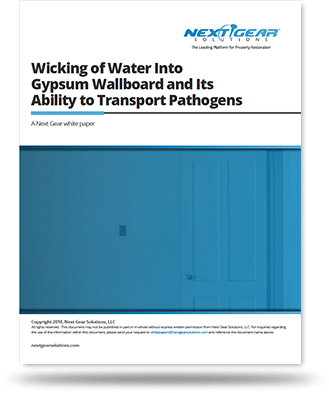 White Paper – Wicking of Water in Gypsum Wallboard - Next Gear Solutions, Inc.
A study to drywall contamination in water mitigation. Can pathogens pass through the pores in drywall? There is much debate in the restoration community on the restorability of Gypsum wallboard (more commonly called drywall or sheetrock) when affected by what the IICRC S500 classifies as Category 2 or 3 contaminated water losses. The actual IICRC S500 v2006 standard even had a contradiction in the document in this area of whether gypsum wallboard is restorable or not in a Category 2 water loss. This was the only contradiction in the standard versus the reference guide. However, the new S500 v2015 has cleared up the contradiction, because the statement still leaves room for professional interpretation.